Mila is eating her poached egg on toast kindly prepared by her papa…Lucas (a LOT bigger now than on the photo) goes out in the garden, leaving the door open. I couldn’t help laughing…Kids are such matter-of-fact. Mila mange l’oeuf poche que son papa lui a gentiment prepare pour le petit dej’…Lucas (BEAUCOUP plus gros que sur la photo) sort dans le jardin, laissant la porte ouverte. Je n’ai pas pu m’empecher de rire…Les gamins sont si directs. I d’ont even know Uggly Betty but I’m sure I’d love it!! 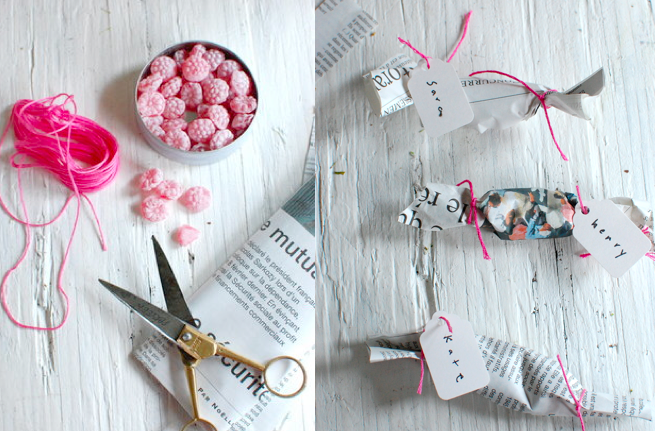 Let’s do something crazy and add these so cute little paper-sweet-bags!! that is so funny, she sounds wonderful, and an ugly betty party sounds great too!!! That’s funny how you were the only one watching it with your daughter!